Asus is the manufacturer that came up with the whole idea of a netbook computer, a smaller, cheaper kind of laptop that’s ideal for relatively undemanding users. 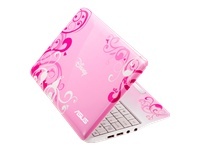 Having tied in with Lamborghini for its high-end VX5 laptop Asus is trying a similar thing with its Eee PC netbook range. Not a bad computer, but in the end you’re paying a lot for the Disney branding.